Healthcare…Monitoring with PKG System Helps Change Care in Nearly a Third of Parkinson’s Cases, Real-World Study Reports, featuring Global Kinetics. Cybersecurity…BioCatch Explains How Behavioral Biometrics Can Stop Vishing Fraud. Agriculture…Taranis Named to the 2019 CB Insights AI 100 List of Most Innovative Artificial Intelligence Startups. Content vs. Contacts. 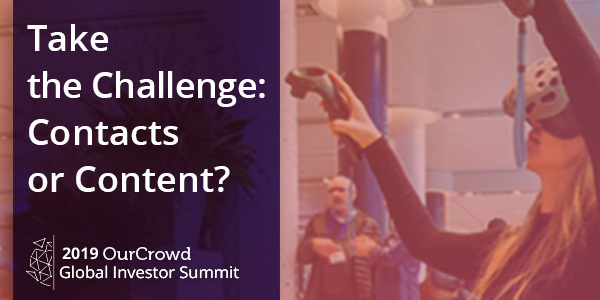 Will you spend the majority of your time at the 2019 OurCrowd Global Investor Summit in sessions or networking? Well, that’s up to you but it all starts with a ticket! Don’t miss top keynote speakers and panelists from around the world and incredible networking this March 7th!